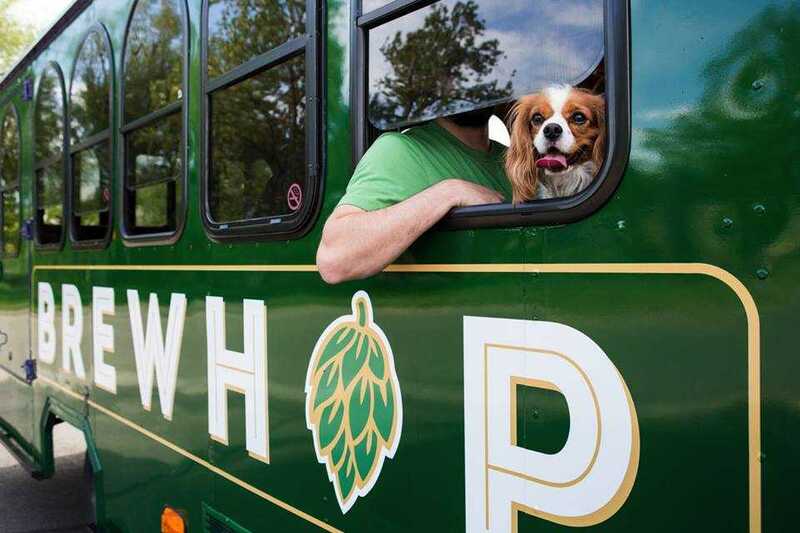 The Brewhop Trolley. Courtesy photo. This is the next level of bar-hopping: on a trolley. 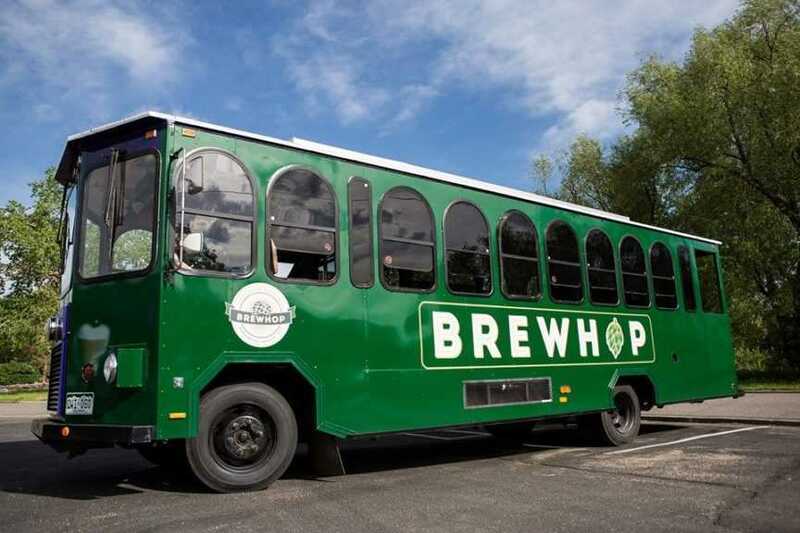 Longmont is home to the Brewhop Trolley, the only trolley of its kind in the state of Colorado. 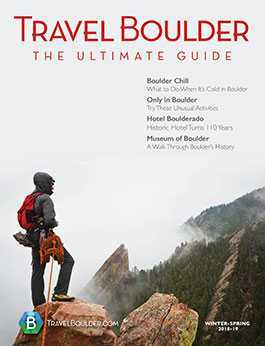 And the trolley recently launched an expansion to include two other Boulder County destinations: Gunbarrel and Niwot. There are multiple different ways to ride this quirky green vehicle: as a hop-on/hop-off tour at your own pace; as part of a special event; or on a private ride. 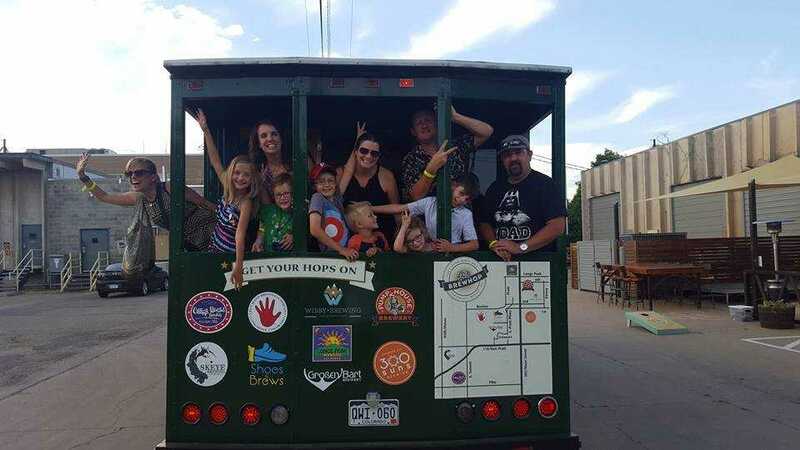 “We’re getting a lot of people looking to come to Colorado for vacation — they come to Longmont instead of other cities because of the trolley,” says founder and owner David Lewis, a Longmont native. This is how the trolley started. It loops through Longmont’s 11 craft breweries, two distilleries and cidery, and guests can get on and off wherever they want. The full loop takes about an hour, so once you step off, you have an hour to conquer a flight or sip a beer before the wheels swing back by. The trolley runs noon to 9 p.m. on Saturdays and Sundays. If you do the math — there are nine hours of rides and 11 breweries — you probably can’t visit every brewery in Longmont in a single day (even if you could and, moreover, wanted to drink for nine hours straight). Some riders set the goal to visit all of the stops, so they start at a brewery that opens at 11 a.m. and have a drink before the route starts; and then they share one hour between a few of the downtown breweries that are close enough to be within walking distance. Much more frequently, people just hop on the trolley for fun, to try something new or to have a guaranteed sober ride. In that case, Lewis recommends taking an Uber or rideshare from home or the hotel to the first stop and taking it again back home; leave your car parked. The trolley is a great way to get a taste (and atmosphere) sampling and perhaps find a new favorite drink. That could be why the most popular breweries on the stop are actually the lesser-known ones, Lewis says. Riders often want to explore breweries they’ve never visited or heard of before. This is no booze cruise. Families are welcome. A brewery tour ticket costs $15, with as many hops on and off as you want. Mix and match. Bring or buy a growler and fill it with beer. The trolley has ice-filled coolers to keep it chilled. Stop in downtown around dinner time to get a break and bite to eat. Downtown has some new and fantastic restaurants, like The Roost and Jefe’s tacos. Plus, downtown Longmont is super long — long enough to walk it off and recharge for round two. Saturday morning food tours: 9:30 a.m. to noon, visit five restaurants and sample different food and drink, all included; $15 per person. Monday night food tours: Every other Monday from 5:30 to 8 p.m., visit four restaurants and spend about 30 minutes at each. Food and a drink is included at each stop in the $20 per person price. Progressive dinners: The last Wednesday of each month (with more on the schedule, due to demand). These are called “progressive” because they build the meal throughout the night. The trolley stops at three restaurants. The first serves appetizers and a drink. The second is the main course with a drink. The third is dessert with a drink. Tickets are $20 per person. He says 80 to 90 percent of his riders haven’t been to the restaurants they visit before. Many restaurants offer discount incentives to Brewhop riders to give them a reason to come back. The Brewhop also organizes other tours. 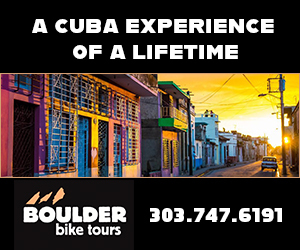 For example, there has been a cocktail tour, a coffee tour (four coffee shops and a restaurant, with coffee samples, pastries, muffins and breakfast foods), a comedy ride, a holiday lights tour, a Denver Broncos tailgating trolley and various art-centered tours. 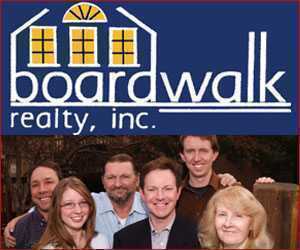 The second Friday of each month May through October, downtown Longmont holds a community event. During that, the trolley offers discounted $1 rides in a shorter loop of downtown from 6-9:30 p.m. A buck gets you trolley access throughout the evening. The trolley continues to grow. Last year, in only its second year, nearly 7,000 people rode. 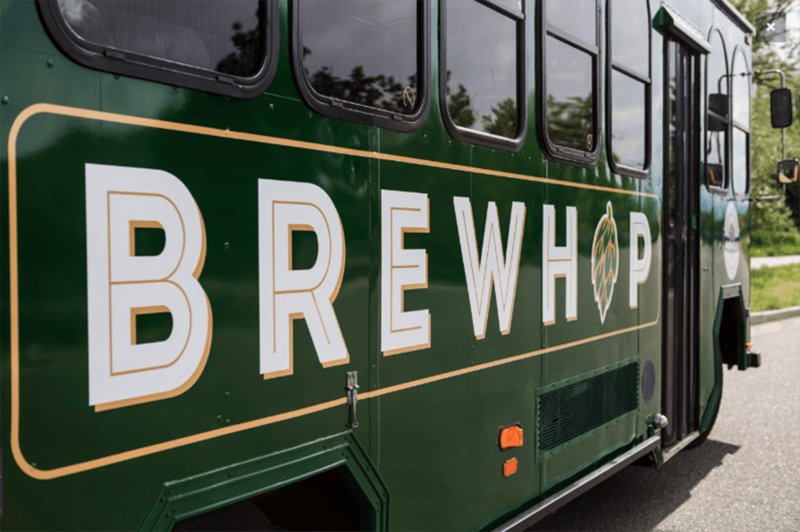 Due to an increased demand in private rentals on weekends (hello, birthdays and bachelor parties), the Brewhop recently added two more trolleys to the fleet. It’s gearing up for its first expansion: routes in nearby Niwot and Gunbarrel, with plans to expand to Boulder in the future and potentially other cities across Colorado. The trolley is also partnering with Longmont’s new homebrewer stop, Brewmented. There’s talk of offering a special homebrewer tour, which would include an hour-long class, stop by a hops farm and other supply spots and a private chat with a successful brewer. You can pre-purchase tickets online for whatever day and event you want, to assure there’s space. If you buy a special food tour, you can add on a brewery tour for the rest of the day for $5 more. If you only want a ride between two or three stops, or you get a late start, you can buy $3 single rides. Every time you board, it costs $3. Some breweries offer special deals for trolley riders, like $1 off pints. Lefthand offers 20 percent off merch for hoppers. One of the coolest features Lewis offers is his weekly Facebook posts. He compiles all of that weekend’s events and specials in a single Facebook post, organized by the order that the trolley stops in, so you can see what’s going on and plan your weekend. No need to visit every brewery’s individual page. It’s all in one spot. Bring cash. Some pubs only take cash or check. Beware of the Tasty Weasel if you have a peanut allergy. If you are local and plan on using the trolley a lot, consider a $199 year pass (which also gives you presale access to tickets and 15 percent off) or a $329 lifetime pass.